Before, During and After: Ecce Homo by 19th-century painter Elías García Martínez on the walls of the church of Santuario de Misericordia. Image Source: Telegraph. 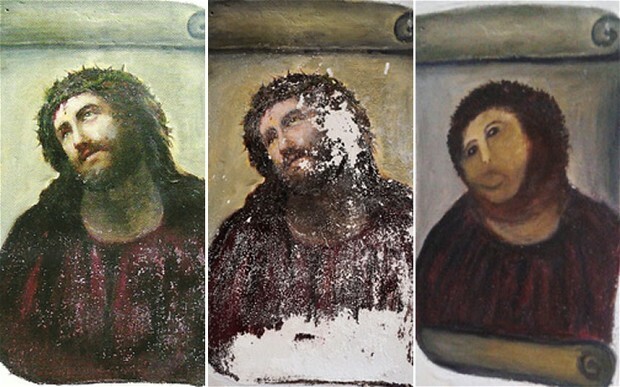 Three separate photographs of Ecce Homo by painter Elias Garcia Martinez show extensive damage caused by an elderly woman who decided the masterpiece needed a little refurbishment. But in a time of austerity, rather than calling in a professional to complete the job, the unnamed woman attempted to restore the mural herself – at a devastating cost. The result was a botched repair where the intricate brush strokes of Martinez were replaced with a haphazard splattering of the octogenarian's paint. Years of carefully calculated depth of expression simply washed out by copious amounts of red and brown. The damage was discovered after the 19th century painter's granddaughter made a donation to the Centro de Estudios Borjanos in Borja, Spain, a couple of weeks ago. The Centro holds an archive of regional religious paintings with regularly-updated photographs. After receiving the donation, employees at the Centro went to check on the mural at the church of Santuario de Misericodia only to find it drastically altered."